If you think D’banj is the only Nigerian celebrity living a lavish lifestyle, you better think twice. 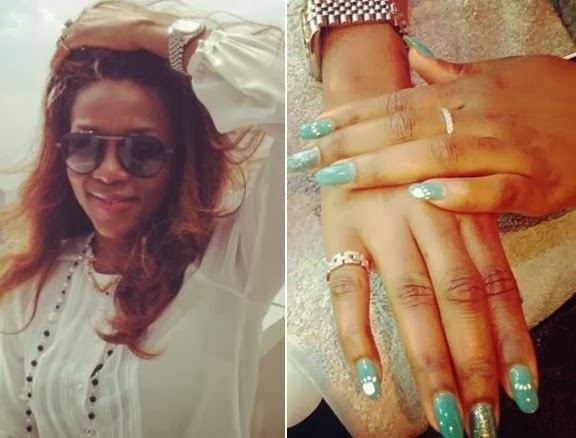 Nollywood actress Genevieve Nnaji who was recently spotted with one of the most expensive purse brand in the world has been tagged a lavish spender. The mother of one shared the above photos of her self rocking an expensive silver Rolex watch on her Instagram page few weeks ago, little did we know that the watch in question is a $25,000 rare brand of the luxury watch. From expensive mansion to expensive bag now expensive wrist watch, mama Chimebuka got them all. She is truly blessed. Hmmmmm is Nollywood this lucrative abi she dey do corner corner business? don’t know why we have this mentality of ”everybody getting married”. there is no place in the bible, that states all must get married. the alarming rate of divorce in Nigeria would make one think twice. she has a daughter i think that is enough for her if she is not considering marriage. Dis is irrelevances n unprofitable engagements. If i may ask, Wat else does d watch do dan telling d tym? If so, if i hv 2 purchase a watch dis xpensive, dat watch shld b able 2 tell me whn Jesus Christ will come. Genny,if you ever need a bodyguard when stepping out,Red is your girl,I can handle anything,I shoot without missing even if the target is in motion.girl seriously you need a strong adviser,is getting out if hand oo,it might be the last stage of shopping addiction,it happened to me till my sister stepped in and freeze all my credit card in the our freezer,you keep buying the things you need and those you will never use in life,I remember buying a pair of CL shoe for $2200 and when it was not my perfect size,I had to sleep outside their shop that night to enable me return it and get my money back when the madness cleared from my eyes and head,not minding the cold.so make una no too blame am,her sisters should pls talk to her if was my one time sickness for the betterment of her and the man that will marry her.I rebuke the spirit of shopping madness in the life of anybody in this naijagist. because the thing dey dangerous oo,you no happy till you spend unnecessary money for the thing wey you no go like d next day,na him be number symptom . Well…that is celebs life…they love bn noticed where ever they are…is like that all over the world…so jenny keep on rocking…but my little concern is that..i stand to be corrected thou…i av never heard of any charity work jenny is championing…or see her giving back to pple…unlike chika ike ..atubborn jim iyke and co..
Nollywood is all about copying Hollywoodin the state.Showcasingwhateverthey have to the public rarely help the poor. The same way their marriage crashes within years. Too much money genny babe dey rock d town,is ur time use it my genny. our celebrities should use their money wisely even though they struggled to get it but buying this expensive watch worth millions i think the money can be used for better things like helping those that we are better of than. abeg genny think twice. D Hunter,Am sure i will not be hitting the gym for 6months,you made me laugh so much that i can see my six packs fighting against each other,I need same watch pls.thanks for this. its your money Genny girl however you got it is your business, life is for the living, money is for the spending. Pliz. Does it tell the time Jesus will come back? IF I GET 25 MILLION NARIA I WILL JUST USE THE MONEY TO BUY 2014 BMW BRAND NEW. GOD PLEASE BLESS ME FOR THE SAKE OF MY MOM. I KNOW YOU CAN DO ALL THINGS AMEN. Jenny, groove is ur time joor. Don’t mind some busy body people ooo. Me I like u!